The 5-1/4” Waterous Pacer® fire hydrant, by AMERICAN Flow Control, offers a sleek and stylish design that blends perfectly with today’s modern architecture. The Waterous Pacer is AWWA rated for 250 psig and meets or exceeds all of the requirements of ANSI/AWWA C502. Ductile iron construction assures strength and durability. Introduced in 1967, the Pacer fire hydrant provides real solutions to today’s system demands. With many cities experiencing increased pressure to stretch their dollars, it is important to note that the Pacer hydrant can be maintained by just one person. The removal of four nuts and bolts allows access to all working parts. The Pacer hydrant has all the features you expect from a high-quality fire hydrant. The all-bronze seat and bronze seat insert assure that the Pacer hydrant remains easy to repair. 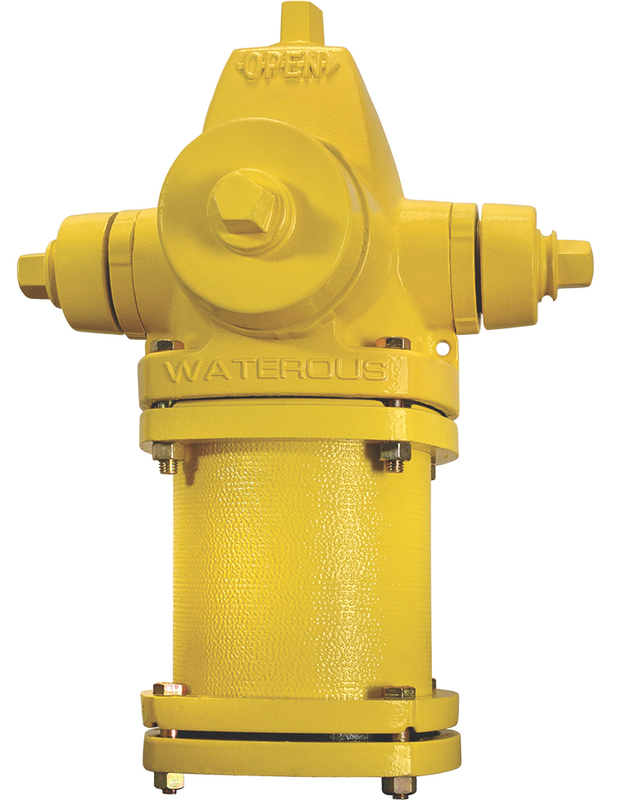 The epoxy primed and polyurethane top coat system on the external surfaces on the upper barrel of the Waterous Pacer fire hydrant provides a durable, high-gloss finish that, under normal conditions, should continue to look good for years without repainting. The Pacer design has been manufactured for nearly than 50 years. The 5-1/4” Waterous Pacer fire hydrant is Certified as complying with NSF/ANSI 61 and NSF/ANSI 372, which exhibit compliance with the U.S. Safe Drinking Water Act.